Botswana accommodation, hotels and lodges. Botswana is safari country par excellence. Let us tailormake a safari to suit your needs. There is no need to accommodate others when you spend your hard-earned money on something quite as unique. We supply the vehicle, set up camp and make sure that you will thoroughly enjoy the trip. Accommodation in Botswana is not cheap, but you will be surprised to see how affordable a private safari with 4 people can be. Don't hesitate to contact us. Botswana's remote parks and reserves offer a diverse and abundant variety of wildlife that relatively few people are fortunate enough to experience. Botswana, a peaceful, landlocked country in Southern Africa, shares its borders with South Africa in the south and east, Namibia in the north and west, Zimbabwe in the north east, and Zambia in the north. Botswana has become increasingly prosperous since its independence in 1966 and is served by a network of good roads. The renowned Okavango Delta is the largest inland river delta in the world. Its myriad small islands are home to an amazing variety of birds, plants and animals. It's waters teem with hippos and crocodiles. Travel is mainly by Mokoro (dugout canoe), a quiet and tranquil experience. In the Chobe National Park, internationally recognised for its immense elephant population, it is possible to see herds in excess of hundreds of the mighty beasts. Chobe's 10 000 sq kilometres is packed with wildlife such as lion, cheetah, buffalo and many others. In addition the bird life is spectacular. At the Makgadigadi pans, southeast of Chobe, you will see large herds of blue wildebeest and several antelope species. The flamingos are a sight to behold. Much of the rest of Botswana is taken up by the Kalahari Desert, a vast expanse of sand, savanna and grassland and one of the richest wildlife regions in Africa. Once in Botswana you are close to the Victoria Falls. Whether you want to visit the Victoria Falls from Zambia or Zimbabwe, you are less than 200 km away whilst in Chobe. Explore this ecological wonderland under the guidance of Temba Safaris, choose your own knowledgeable and well-trained safari guide or game ranger. We tailor-make safaris that includes all the highlights, i.e. the world-renowned Okavango Delta and the Central Kalahari National Park. Botswana remains one of the jewels of Africa. The infrastructure might not be quite what the Western world is used to, but it manages to combine a breathtaking wilderness experience with the advantage of many modern and up to date facilities. 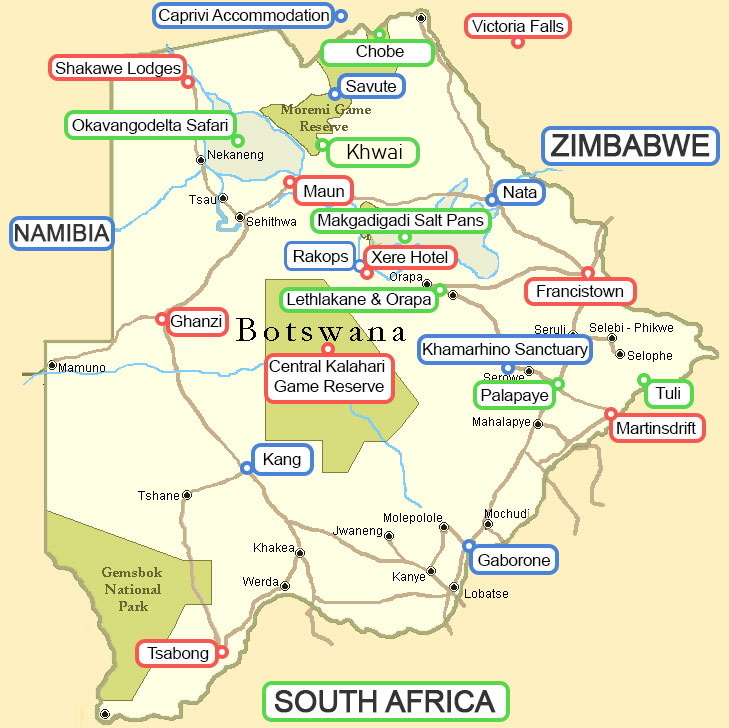 Botswana lies wedged between South Africa to the south east, Namibia to the west and north, and Zimbabwe to the north east. Botswana is a wild and beautiful country. With Zambia as its far north east boundary Botswana can offer any traveler access to some of the most unique natural wonders in Africa. Botswana might have started out as a poor African country, but since 1966 when it gained independence from the United Kingdom, it has developed into one of Africa's wealthiest countries. This can be attributed to diamond mining activities and cattle farming. Today tourism is one of Botswana's most vibrant and thriving industries. 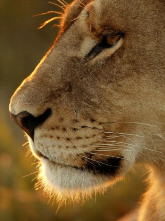 Temba operates in Botswana as Sabaki Safaris. Most South African visitors enter Botswana at one of the southernmost border crossings over the Limpopo River or enter through the Kalahari Transfrontier park. If you enter at the Martin's Drift border post you will soon find yourself in the Tuli Block. There are plans in the pipeline to develop another Transfrontier Park in this area encompassing land in Botswana and neighboring countries. Tuli Game Reserve is well worth a visit. You will find elephant, lion, leopard and a wide variety of other game. If you are looking for luxury accommodation in the Tuli Block in Botswana you will find that Tuli Safari Lodge is a good option. The town of Palapye lies 100 km north of Martin's drift. An alternative route is from Gaborone where you drive via Mahalapye to reach Palapye. From Palapye you can make the choice to travel north to Francistown or take the route west to Serowe. If you visit Serowe today you will find it to be a relatively modern city, but not many years ago it was known as the traditional capital of Botswana. Little remains of the traditional African homesteads. Many people are unaware that Botswana is the world's largest producer of high quality diamonds. Orapa is a secure town due to the fact that most of the diamond mining activities are situated around this town. You can only enter the town with a permit. You can stock up on supplies and fuel in Orapa's twin town, Lethlakane. If you need to sleep over, Accommodation is available at Mikelele Motel. Orapa lies on the main road north west of Serowe. From Orapa it is 30 km to Khama Rhino Sanctuary. This 8000 ha reserve was named after the father of the present president of Botswana. As the name implies, rhino and many other species of game can be sighted here. Neat self-catering (self contained) chalets are available and it is a wonderful place to camp on your way to the north. Heading further to the west the road veers around Orapa to Mopipi and Rakops. The only accommodation in the small town of Rakops is Xere Motel. The next stopover on this road is Maun. Maun is a bustling central point in Botswana. In many ways it is a pivotal point for any traveller as it is the gateway to the Okavango Delta to the north and has a busy light aircraft airport for all the fly-in visitors. Unfortunately, Maun is no great beauty, but it is certainly very interesting. It seems that town planners arrived long after most of the town was built and the slightly chaotic design attests to this. Many visitors overnight in Maun before departing to Moremi or Chobe National Parks. It is the perfect place to fill up your tank and replenish your supplies before heading into the bush. Car rentals are available and many activities, such as flights over the delta can be done from Maun. Maun caters for its visitors well. Maun Lodge and Riley's Hoteloffer hotel accommodation while Island Safari Lodge and Thamalakane River Lodge offer excellent affordable accommodation on the Thamalakane River. Okavango River Lodge offers budget accommodation closer to Maun. It is difficult to describe the unspoiled wonder of the Okavango Delta in Botswana if one has not yet been there. Suffice to say that it is still one of the last wilderness areas on this planet. In order to visit the luxury lodges deeper in the Okavango Delta you will need to fly from Maun. Daily flights are offered for most of the lodges. Some of the world's most expensive accommodation is to be found in the Okavango Delta. Compared to some of the other lodges, Oddballs is reasonably priced. You might find that Delta Camp is more expensive and Eagle Island's prices reflect their quality and high standard. If your wallet places limits on you, you can rent a vehicle in Maun to visit the Moremi Game Reserve. 4x4 vehicle rental is available from Temba Car Hire in Maun, Botswana. Santawanti Lodge is an affordable lodge on your way to the wilderness area. Although there is limited game in this area, it remains a good overnight spot as does the Kaziinkini campsite near South Gate which is the southernmost gate to the Moremi National Park. The first campsite in the Moremi National Park is called South Gate. From South Gate you should allow for at least 40 minutes to cover the 30 km to North Gate or Khwai River. From here most travelers choose the route over Third Bridge or Xaxanaka. Third Bridge does have a public campsite. Xakanaxa is deeper in the Okavango Delta and has three lodges, Camp Moremi, Xakanaxa Camp and Camp Okuti. These are all luxury lodges, but there is also a public campsite if camping is your first choice. Allow for 2 hours to cover the 60 km to North Gate where you can camp if you want to stay over or you can stay at Khwai River Lodge. If camping is your choice there is either the public campsite at Khwai River or the community campsite in the village at Khwai. This area is renown for game viewing in Botswana. From here travelling north to the Savuti is deep sand. It is slow driving, but well worth it when you reach Savuti in the Chobe National Park. There is a public campsite at Savuti. There is also the choice of visiting the Savute Elephant Lodge - a luxurious experience for those that can afford it. From Savuti it will take at least 4 hours to travel the distance by road to the Chobe River and Kasane. Another alternative is to head for the famous Linyanti Swamps. Linyanti lies about 2 hours drive north of Savuti. This track is deep sand and slow driving. From Linyanti it will take you about 4 hours to the town of Kasane. Once you are in Kasane you are in the center of an incredible variety of choices to see some of the most beautiful parts of Africa. Some excellent lodges are to be found around Chobe and Kasane. Chobe Safari Lodge is highly recommended and very well known world wide. They offer 4 star luxury and have the advantage of nestling up against the Chobe National Park border. Mowana Safari Lodge is more pricey, but has some superior facilities such as a golf course and spa. The Big Five Chobe (Toro) Lodge is more affordable. Then there is Senyati Safari Lodge which offers self-catering (self-contained) accommodation and camping in the bush and has its own waterhole. Most people visiting Kasane and Chobe in Botswana would be tempted to visit Victoria Falls in Zimbabwe. Victoria Falls is only about 90 km away and remains one of the wonders of the world. There is plenty of high quality and affordable accommodation in and around the town of Victoria Falls. Ilala Lodge offers luxury hotel accommodation close to the Falls and Kingdom Hotel offers excellent value for money. The A'Zambezi River Lodge is upstream on the banks of the Zambezi. The very luxurious Elephant Hills Hotel is surrounded by an 18-hole golf course. Victoria Falls Hotel has a wonderful history dating back to the beginning of the previous century. You will be charmed by the luxury and old world atmosphere. If you are a camper or looking for self-catering (self contained) accommodation, look no further than Victoria Falls Rest Camp. It is not only the breathtaking Victoria Falls that will draw you to the town of Victoria Falls. This town has also become Africa's adventure capital. Take a flight over the Victoria Falls with a helicopter or take on the challenge of white water rafting in class 5 rapids. In Victoria Falls you can walk with lions, go bungi jumping or take an Elephant Back Safari. For those that prefer more restful activities there is always the option of a sundowner cruise on the Zambezi. Then it is back to Kasane. From Kasane you can choose to go straight back to South Africa via Nata and Francistown if your holiday time is limited. If you choose this option you will drive south from Kasane and the first village you would pass through is Pandamatenga. Pandamatenga is often called the "Bread Basket" of Botswana due to the large commercial farms in this area. Keep your eyes open when you drive between Kasane and Pandamantenga as there are often elephants crossing the road in this area. Driving at night can be extremely dangerous here and it is strongly recommended that you should avoid it. Three hundred km south of Kasane lies Nata. Nata is a small town halfway between Maun and Kasane, and 200 km from Francistown. Nata Lodge and Northgate Lodge are good overnight options. Just north Of Nata is Elephant Sands Lodge. Nata lies on the edge of the Makgadigadi Pans in Botswana. The Makgadigadi are the world's largest salt pans and are very impressive with their endless, barren vistas. About 100 km west of Nata is a small town called Gweta where you can stay at either the Gweta Lodge or at Planet Boabab. If you want to experience the silence and majesty of the huge desert-like pans, you could also try a more luxurious and very romantic option at Jack's Camp. If you stay over here you will be treated to a quad bike trip to the pans, and the option of a night sleeping out in the starlight on the open pans. From Nata it is a easy trip south to Francistown, Botswana's second largest city. Francistown is an industrial hub with few tourist attractions, but can make a good overnight stop for those traveling from Kasane, the Okavango Delta or Bulawayo in Zimbabwe. Woodlands which is 10 km north of Francistown, is an ideal option for camping or a family stopover. The Tapamha Hotel or the Metcourt Hotel in Francistown are alternative options. If you find yourself in Kasane and have more time on hand there is the option of doing a round trip around the Okavango delta. This means you will cross the border at Ngoma Bridge border and stay for 1 or 2 nights accommodation in Caprivi, before returning via Shakawe to Botswana. From Kasane the road to Ngoma Bridge runs right through the National Park for 50 km. Chobe National Park is one of the favorite game reserves in Botswana, with excellent game viewing along the Chobe River. Then you are in the Caprivi and can spend a few nights there before turning south to cross the border at Mohembo and heading south to Shakawe. Accommodation near Shakawe is fairly affordable when compared to other places in the Okavango Delta. Drotsky's Cabins is the most popular lodge for accommodation and camping along the western side of the Okavango Delta. You do not need a 4 x 4 to reach Drotsky's Cabins. Nguma Island Lodge is a more luxurious option in this area and lies deeper in the delta and south of Shakawe. Delta Dawn is Nguma Island's campsite. The facilities are good, and there is excellent fishing. The view over the delta from Nguma Island Lodge is breathtaking. You will need a 4x4 to get to Nguma Island. From Shakawe you will travel down the western edge of the delta to Ghanzi. There is less game along the main route due to the fact that it is communal farm land. However the Okavango Delta in this area is as protected as elsewhere in Botswana and the birdlife along the western panhandle of the Okavango Delta is perhaps the very best that you will experience in Botswana. The fishing in this area is equally good. Ghanzi is one of the gateways to the Kalahari. The Central Kalahari Game Reserve lies to the east of Ghanzi and is the world's largest National Park. Botswana National Parks now have an office in Ghanzi where you can pay your park fees. The majority of people visiting the Central Kalahari Game Reserve are adventurous types and choose to camp in one of the public campsites. However there are two luxury lodges in the north of the park. Deception Valley Lodge and Haina Safari Lodge both offer high quality accommodation and guided activities. Ghanzi is a thriving cattle district in Botswana. Just outside of Ghanzi is Thakadu Camp. Thakadu Camp is a game farm with affordable, clean tented or chalet accommodation. Their service is excellent. Another option 4 km outside of Ghanzi is Khawa Lodge. In the town of Ghanzi is the Kalahari Arms Hotel. This hotel was one of the first hotels in this area and has a romantic if somewhat rough history. Today it is a good option for anyone on business in Ghanzi in Botswana. Travelling south you will reach the Trans Kgalagadi Highway and you will soon reach Kang. This town lies halfway between Johannesburg and Windhoek and is a natural stopover no matter which direction you are heading. Here we strongly recommend Kang Ultra Stop. The lodge is an oasis along this dusty and busy road. Echo Lodge is an equally affordable option in Kang. At Lobatse which is about 60 km from Gaborone, you will notice the factories that process Botswana's meat supplies. From Lobatse you can drive along the South African border to Tsabong which is Botswana's most southern town. Near Tsabong you can overnight at Berrybush. Berrybush provides basic neat accommodation. The Mokolodi Nature Reserve is a restful overnight stop near Gaborone and has plenty of game including rhino. The accommodation offered here is neat self-catering (self-contained) chalets or basic campsites. Gaborone is Africa's fastest growing city. Gaborone is a vibrant capital and has all the attractions and facilities one would expect. It is a bustling place. The population of Botswana is just 1,5 million people and about a quarter of them live in and around Gaborone. Cresta Lodge is an excellent hotel near the CBD and is our preferred choice. The President Hotel is a good central option. If you are looking for a really luxurious option, the Gaborone Sun Hotel is the place to stay. The Ambassador Hotel at the is a luxurious five star hotel just 8 minutes from the CBD with the offering more affordable three star accommodation. Oasis Motel is a affordable option. The only camping in Gaborone is at City Camp which is basic yet clean, however their service and booking systems are non-existent. If you just want to pop in you can see if there is a spot for you to camp. They also have a few basic self-catering (self-contained) chalets. Do your Africa Botswana accommodation bookings through Temba. We do online reservations for Botswana National Parks and we tailormake tours and make sure that you pay less for Botswana and Okavango lodges and other accommodation. Botswana safaris must include an Okavango safari. It might be pricey but a Botswana luxury safari remains the best tailormade tour that you could dream of. We will easily put your Botswana and Okavango tailormade holiday together at prices that will be impossible to equal or improve on. Copyright © 1988. Temba Botswana. All Rights Reserved.